George Parker caught the first 1,000-lb blue marlin in the Pacific Ocean while trolling 5 miles off the shore of Oahu on his boat the MONA H. The marlin struck a lure that George had made using a towel rack. 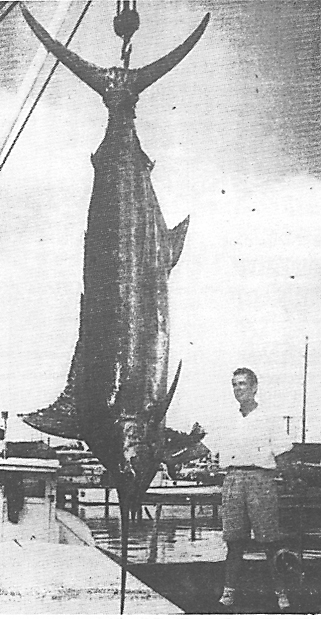 George battled the marlin on 80-lb test line, then fought the IGFA for 5 years until they recognized the fish as a blue, not a black, marlin. Georges wife Mona was pregnant with a son when George caught his fish and they named the baby Marlin. Marlin Parker grew up and has caught granders of his own.